a change of circumstances or fortune, typically one that is unwelcome or unpleasant. Here in California we are finally getting much-needed rain. The drought has been more severe than when we moved here 25+ years ago. Showers and clouds are quite welcome in these parts, provided they do not block out the next great celestial event. The next great shower is the Geminids on the night of December 13th into the morning of December 14th. Fortunately that is a weekend, unfortunately the moon is in its last quarter so it will rise near midnight just as the shower generally becomes more intense. Dress very warmly. A thermos of hot beverages is strongly recommended. Get in as dark a sky as possible away from sources of light pollution, streetlights, etc. Do not use a flashlight. Let your eyes dark adapt so they can see their best. Get a comfortable fully reclining chair and look STRAIGHT up. You’ll see more meteors if you can see the entire sky. While the meteors will appear to come from the constellation Gemini they can appear anywhere in the sky. The constellation Gemini – from which all the meteors of the shower appear to radiate rises at about 7:30 PM local time in the North East. At that time, the Andromeda Galaxy will be almost straight above you for most people in mid-northern latitudes. By midnight, Gemini will be overhead. We recommend a Planisphere or an app if you want to identify the constellations, but to enjoy the shower you need nothing but your eyes. In prior articles have covered how to find a dark location and how to plan for and photograph a meteor shower. And we even have a thorough article that explains why you probably DID NOT photograph a meteor. 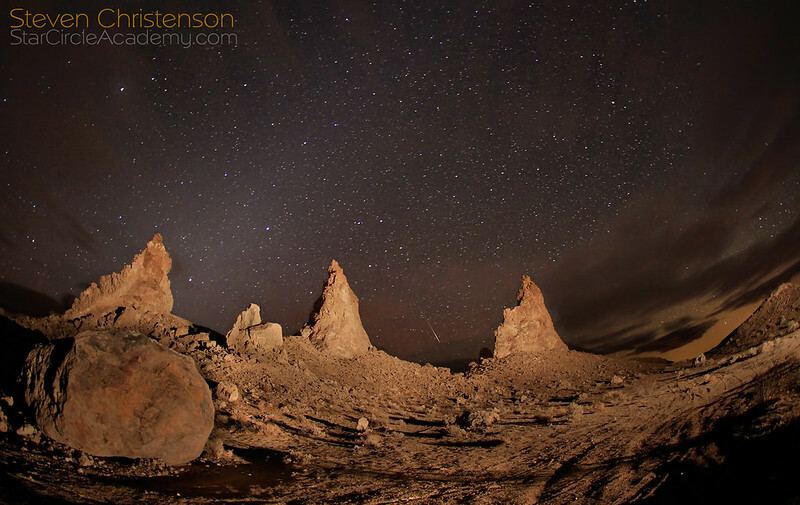 We even have led expeditions to capture meteor showers in a dark location. Unfortunately this year we have faced other vicissitudes. Showers in Life Download link error – hopefully resolved now. We have weathered several storms ourselves recently, and like you find ourselves wondering where all the time went. Most recently we were reminded how difficult it can be to maintain a website and sell digital goods. An increasing number of customers complained that the digital goods they ordered could not be downloaded. We discovered that Google was the problem! We had been using goo.gl to create short links instead of long, sometimes multi-line links for downloading content, but Google insists – for your safety – to check the contents of each of those links. It would have been fine had this happened once or twice, but we noticed that Google US, Google Czechoslovakia, Google Japan, and Google Brazil (and others) all separately scanned the links, sometimes multiple times. And then your virus scanner may also have downloaded and inspected the content before it would let YOU have it… It was a lot of wasted bandwidth and irritation. We rejiggered our software to resolve the issue. Bottom line if you recently purchased content and got a “Too Many Download Attempts” message, we think it should now work if you try again. We apologize for any inconvenience. Also, as you may know, running a website is not for the faint of heart. For example, we are seeing another increase in attacks from Chinese Comment Spam robots as well as attackers in the countries of Georgia and Germany. On a personal matter, Steven – the primary contributor to this website – was the sole survivor of an entire team that was laid off at his day job. Steven was fettered with sole responsibility for a vast armada of servers and networks – which all fell on their knees when a 30 second power interruption wreaked havoc. He also found that there were problems with his own home network which he has been building to be able to conduct webinars again (and to thwart robocallers) … His home network is still not reliable enough, unfortunately! Meanwhile, we are still working hard on our 2015 schedule of events. Please bear with us. This entry was posted in Astronomical Event, Photo Tip and tagged celestial events, cloud, dark skies, Geminids, lay-offs, network, outages, photography, planning, rain, robots on December 3, 2014 by Steven Christenson.